Only available on sizes up to 1 1/2"
Positioner board allows for modulating control of the valve with either a 4-20mA or 0-10VDC control signal. If control signal is lost and main power is present, actuator will move the valve to the position corresponding to the low end of signal. Only available on sizes up to 2"
The DPS is a digital positioning system that uses a microprocessor to modulate the actuator in proportion to an anolog input signal (4-20mADC or 0-10VDC). 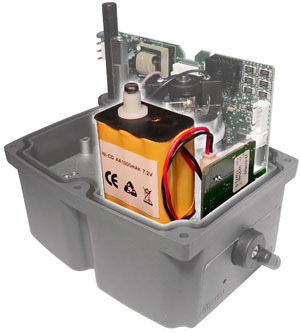 The BSR is a battery fail-safe module where an internal battery pack powers the actuator to the preset failure position "open or closed" upon loss of power. The BSR can be used with the DPS positioner. Actuator ships with Cord Grip (cable gland) DIN Connectors installed.These additional connectors will be included loose in shipment. Simple one screw changeout for each connector. Not available on 4" or 6"